Tatiana’s World was officially born on August 5, 2018. The purpose of creating this blog was for me to have a creative outlet as well as generate income from it. My dream is to be a digital nomad and I have created this blog with the hopes of having that dream come to life sooner than later. I will warn you… I am a serial entrepreneur and tend to jump from one thing to the next, so to stay focused I figured I better create some goals. 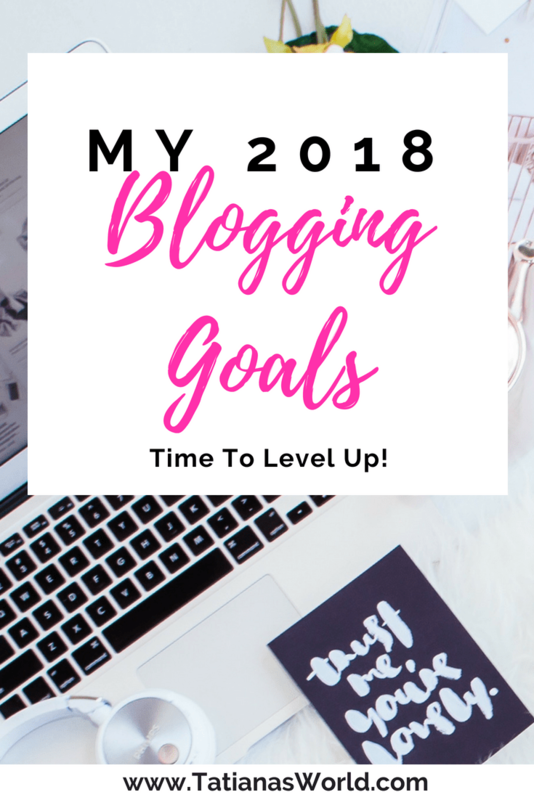 So here are my 2018 blogging goals. So, how am I going to achieve all of this? Lets break each goal down step by step. This is one of the first things that I want to make sure is in order. I am not new to the online world. I had a leisure blog (that I only wrote in leisurely, lol), I have several e-commerce stores and I know a lil about SEO, etc… So I definitely know that I want to have my ads in place for when my traffic starts to increase. So I have attempted to add Google ads and media.net ads on to this site myself but they are only showing up as a blank space. Google ads and Media.net ads I’ve used in the past so I didn’t think that there would be this much lag time before it went live. Perhaps, I installed it incorrectly. Either way, if they are not up and running shortly, I will hire someone on Fiverr to install the ads for me. FIVERR literally has someone to help you with almost any task you can think of and the gigs start at only $5. So if these ads don’t show up in the next 48 hours or so, I will just outsource this task to someone that can do it correctly for me. All of the gurus preach about the need to have an email list. So I need to create an email sign up form. Which Im sure the most popular email sign ups involve some type of freebie that they give in return for your email address. So I will have to figure out what type of freebie to offer. I have signed up for a free 5 day email list building course from Blog With Mo. So now I just need to go thru and implement the strategies that she teaches. I want to grow my traffic to 25,000 page views per month. I will use Google Analytics to track this. I had a wonderful guy on FIVERR set up my analytics for me for only $5. In full transparency as I have literally started my blog 15 days ago… my traffic is probably zero. Wait a minute… i’ll get you guys a screenshot. So in 15 days – i’ve had 16 users and 96 pageviews. So that equals 6.4 people per day. Or 6 people and 1 dog per day. lol. So my goal of growing my blog to 25,000 page views per month is a pretty hefty goal to accomplish by December 31, 2018 but I believe I can do it. To increase my blog traffic (after I have at least 10 blog posts) I will begin to implement the strategies from the e-book I purchased, titled Pinteresting Strategies. Its a good quick read and helped me to grow the traffic on my e-commerce stores. So I know that it will work on increasing my Pinterest views and clicks to my blog. I will also continue to focus on SEO so that I can get some organic traffic from the major search engines. I will also be linking the blog to any youtube vlogs that I do. (Check me out and subscribe to my channel, I’m trying to get to 1000 subscribers.) Why 25,000 page views per month? So I can qualify to be apart of the media vine network. Ok, I have ZERO Facebook likes on my face book page. They always say a goal without a deadline is just a dream. But with how hard it is to get Facebook likes… Im not even sure what type of goal to create for this. I could just buy likes for social proof, but I don’t want to do that. I want to get people on my page who are genuinely interested in my journey. So, I guess we’ll just say the goal is 25 Facebook likes. As of today, I currently have 113 awesome followers on Pinterest. So my 2018 blogging goal is to have 1000 followers by years end. To grow from 113 to 1000 I just need to begin implementing the Pinteresting Strategies and the followers will come. Im sure of that. This goal is only 1 blog post per week. This should be doable. Between myself and my virtual assistants, I should be able to crank out at least that much per month. Four blog posts per month means more content which hopefully means more traffic. I wanted to start my blog as cheaply as possible. So I purchased my domain from Godaddy and linked it to my hosting account. I then installed wordpress and like 4 or 5 different themes. I wasn’t happy with the features of any of them. Partially, because they are the free themes. So, I think I will have to eventually purchase the upgraded theme for like $39 and really perfect the look of my blog. I just didn’t want to put too much money into this blog before it starts bringing in money. So those are my 2018 blogging goals. If you are a blogger what are your goals for the end of the year? Did you set goals January 1? If so, are you achieving them? If not, what are you stuck on? Chime in below!